Ford Motors in conjunction with Coscharis Motors, her Major distributor in Nigeria once again organized their life enhancing Driving Skills for Life (DSFL) programme for motoring journalists in Nigeria under the auspices of the Nigeria Auto Journalists Association annual training for her members. L-R: Motebang Mokoena, Ford Driving Skills For Life (DSFL) Trainer; Abiona Babarinde, General Manager Marketing & Corporate Communications, Coscharis Group; Derek Kirkby, Ford – DSFL Director; and Felix Mahan, Brand Manager Ford, Coscharis Motors; at the DSFL training held in Lagos recently. This DSFL is a specially designed program by Ford, running all over the world with the aim of spreading driving skills and knowledge through “training the trainer”. The NAJA training for her members is an annual event where the motoring correspondents in Nigeria are brought up to speed in the current trends through theory and practical trainings. For two years consecutively now, Ford Motors and Coscharis Motors have flown in foreign professional driver trainers who come to teach/refresh the motoring journalist’s driving competencies especially as regarding safety on the road. As part of his speech during the event, Abiona Babarinde, General Manager – Marketing and Corporate Communications, at Ford’s distributor, Coscharis Motors says: “Ford is very pleased to be able to offer its proven road safety tool in the form of the Driving Skills for Life programme,” commented”. Frank Kintum; Chairman of NAJA presenting an appreciation plaque to the trainers. This is very essential bearing in mind the statement from the Federal Road Safety Commission which says that ‘80% of accidents are due to human factors so training is vital to reduce road deaths and injuries”. The training for this year was very comprehensive as the two trainers sent from Ford Motors; Derek and Mo poured out their hearts out and gave us their best yet in a very warm, rich, entertaining and educating format. The training proper covered areas such as basic tips on safety before and while driving off, use of child seats for child safety, proper utilization of the anti-lock braking system (A.B.S) especially how to successfully use it to dodge obstacles while under heavy braking. Proving the ABS effectiveness with the Ford Figo. 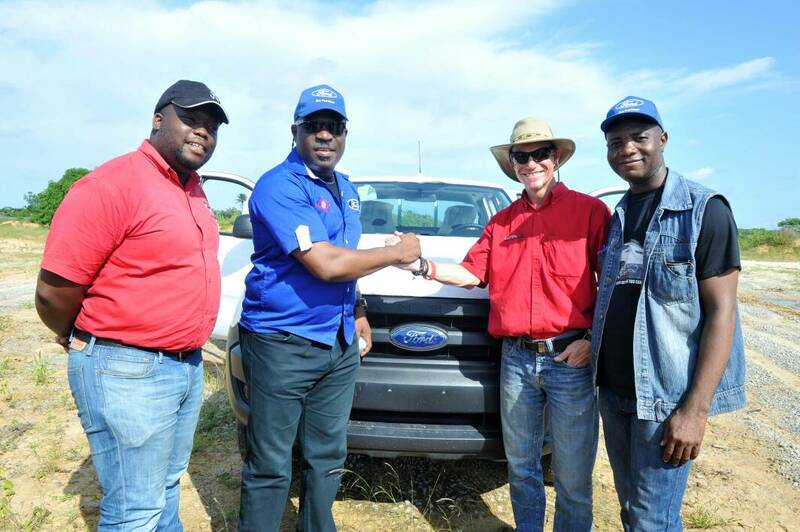 Equally, participants learnt about driving on a 4×4 trail requiring the use of four-wheel drive and about the features that the Ford Ranger offers such as safety, departure angles, brake distance on gravel and anti-lock braking system (A.B.S) and how to use other four-wheel drive functions such as traction control, locking differential and drive train. Demonstrating the awesome effectiveness of the 4 Wheel Drive system of the Ford Ranger while the vehicle is stuck. The highlight to this practical exercise was the segment that simulated driving while drunk which was done with the use of the drunk-driving goggles. This segment is designed to teach participants the many ills of the huge impairment alcoholic drinks bring on a driver and yes, it did prove its point as it became glaring that alcoholic drinks and driving should never be mixed. All the participants once adorning the goggles were not able to correctly drive though the slalom course designed for the event. A participant excited at his new and instant drunk status while wearing the goggles. Ford launched DSFL in the United States in 2003 and the programme has been improved and adapted to suit local conditions in many other global markets over the years. It was launched in South Africa in 2014, introduced into Angola in 2015 and last year it was rolled out in Nigeria, Uganda, and Kenya. Derek showing some details to the participants. Ford DSFL, is a comprehensive programme aimed at providing new skills and information to newly licensed drivers and improve the defensive driving ability of experienced drivers. The programme also addresses both the inexperience of young drivers as well as issues surrounding distracted driving, thereby, enhancing eco-driving to personal safety and the environment. Derek giving child seat tips. Mo briefing participants before it got to their turns. See the driver missing the cones while driving ‘drunk’. My turn to drive ‘drunk’.